Info: Satellite TV, Bedding is available once a week, towels available (1 large, 1 small / per person a week), stove, refrigerator, towels, air conditioning. Balcony: Own balcony, covered, partially covered, with a view to the sea, Tables and chairs for the balcony are available. Bedroom: Double bed, double bed (big), with balcony, with sea view, laminate floor. Living room: Living room is a separate room, two additional beds on one sleeping couch, with balcony, laminate floor. Kitchen: Equipment for eating and cooking, cutlery, etc. are located in apartment, dish towels are available, electric cooker, refrigerator with freezer, electric stove. Characteristics: With a view to the sea, air-conditioned, in silence, in the village. Environment: Own garden, ability to use barbecue, parking provided, common garden, Parking by the house. Surface : 40 m2 (2. floor). Surface : 40 m2 (3. floor). Surface : 40 m2 (4. floor). City of Trogir, in central of Dalmatia we are free to call the Croatian Monte Carlo. The spacious promenade along the coast in downtown, with large palm trees, floor with white stone plates, silver benches groaning world's great luxury places. Along the waterfront, you'll notice a large and luxurious yachts which means that this little renaissance Dalmatian town is well known by clients with deeper pockets, but that does not mean that every normal tourist can not enjoy the beauty of this city. In fact, in city Trogir you can find numerous restaurants, cultural attractions, a variety of entertainment content for each of us. Major role in Trogir tourism is that he is verry near Split Airport, which places Tropgir in an ideal transit tourist destination for a variety of tours cruise along the Adriatic coast. 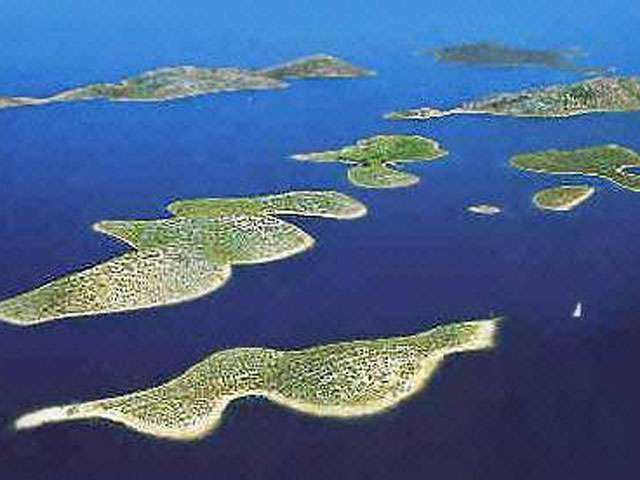 In the vicinity of Trogir, situated on the island of Ciovo is place Okrug Gornji, a place marked by a long pebble beach. The easiest way to get from Trogir to Okrug Gornji is by small taxi boats who constantly driving relationship Trogir - Okrug Gornji for about 3EUR. Terraces and the beauty of old town will make your evening perfect. Check out for yourself in our video, why Trogir carries all the epithets of a small Croatian Monte Carlo. Here you can see a list of Apartments in Trogir. See you in Trogir! From Main Street, with the entrance to the Lodge of the oldest preserved church, in one vol. Barbara. Pole outside the church porch wearing affecting Main Street. The church is divided between three miniature basilica colonnades. In the middle, above the bays at the altar there was originally a dome structure in the belfry.Over the front door threshold is decorated with ornaments and early medieval bird characters and in it is a Latin inscription which reads in translation: "In the name of the Lord I Majo prior, along with my cousin Peter, we decided to save our souls to build this temple." Inside was found an inscription that has been an integral part of a stone altar screen and mentioned church reformer Peter and his wife Dobrica.The church was once decorated with early medieval frescoes preserved in such minute traces. By descriptions and wicker ornaments on the front door and animal figures can be concluded that the church was radically restored in November. century. But the cult of St. Martin, which is spread in the Dalmatian VI. century, in the reign of Emperor Justinian, then more walled fragments with early Christian crosses (the base of the altar asfragment of ancient architecture with carved ancient Christian cross), and the pillars and part of the ancient capitals of origin suggest that the church existed before the current one previous similar in size and shape dedicated to the same saint. .
Church St. Peter belonged to a namesake women`s monastery of the Benedictine Order. By tradition, the monastery was founded by Queen Mary, wife of Bela IV, for your stay in Trogir 1242nd vol. but the monastery was mentioned earlier. There are archaeological indications that the present church site was located early Christian church. Porch, called Lodge (Loggia), mentioned already in 1311 , but in its current form it is put in the XV. century during the Renaissance. The lodge is half-functional public building, a shelter and gathering place, but also a court. Columns carry the roof were brought from ancient ruins, is one of the ancient capital, while the others are medieval. Above court tables are prominent Renaissance reliefs and sculptures, coats of arms and Latin inscriptions relating to justice, "for equality," "You, the Queen, upravljaš Staff and the entire world, through you and gets the right to force everyone gets their own again." The bank has maintained a larger move by the walls of two towers which date from the XIII. century. Between the towers are open to new, the main gate leading to the coast; manirističkih the stylistic features and probably are the work Trifuna Bokanića. Other preserved wooden doors and reinforced with nails. Inscription above the door says that the translation reads: "Delfin Delfino, praetor Knight, made sure that this city was once a Roman, especially generous because of antiquities and the famous people who were born, protected eternal defending his bishop blessed John, garnish with those really great door The Lord`s 1593rd " With the gate-lodge is located in the service porch today`s fish market, built in the early sixteenth. century, which would, according to tradition, the visitor shelter and when the night closed the entrance to the city. On the coast near the city gate is standarac-pole to hang the flag-erected in 1605, is considered part Trifuna Bokanića. Land Gate was built around the 1656th in the baroque style to their repair work in the XVIII. century architect Ignatius Macanovic. The gate is a Gothic statue of the early XV. century and shows the patron saint of Trogir, the bishop of blessed John, this is probably the work of Bonino of Milan, architect and sculptor who was at that time was known in Dalmatia. Kamerlengo Fortress is located on the southwestern edge of town in what was once the final, exposed corner of the wall. The polygonal tower is older, dating from the end of the XIV. century. Upon arrival of the Venetian rule the entire final assembly gets a present form the walls, the building was consulted civil engineer Lorenzo Picino and design is vested protomagistru Marino Radoje. The fortress was built from 1420 the 1437th and was used for the accommodation of the military in a rebellious city. It was named after clerk Kamerlengo (Camerarius), the Venetian treasury. Tower St. Marco is located on the northwest corner of the city facing the mainland, was originally connected to the city walls with Kamerlengo. Round is a shape adapted to the defense of gun shots, and was built during the XV. century during the Turkish attacks. Glorijet - classical-shaped circular colonnade was built in the 1809th in honor of the French marshal Marmont. This is normally one of the few monuments of the French government in Dalmatia. Between St. Mary Lodge and the city, the church of SS. Sebastian rising tower clock tower. The church is built 1477th as a testament to the saving of the plague. The Renaissance facade sculptures are featured with the image of Christ, and the work of the workshop of Nicholas of Florence. The round hole was probably used as a framework within which the figures show, when ticking hours. On the wall between. Sebastian and lodges still hangs a chain by which they bind offenders exposed to general contempt. There are prominent Latin inscriptions with the coats of arms of the dukes of the Venetian, the first is a quote from the Epistle of St. Paul, Galatians (1, 10): "If I adjust to people, not the servant of Christ", the other above it is taken from Psalms (No.111): "In memory of the righteous will be eternal and bad language will not harm him." Ciovo is "swimming" Trogir Trogir, where gentlemen of ancient times built their summer homes. The beaches are pebbly, sandy, rocky and partially paved to facilitate access to, and the most popular are: Pantan Beach - 500 m long pebble and sand beach with pine trees on the eastern side is located 1.5 km from the city center. The whole region is protected natural resort with beautiful Pantan Mills on the north side of the beach. Beach County (district) - the most popular beach on Trogir Riviera, located 5 km from the town of Trogir. Two kilometers long gravel beach is also called "Trogir Copacabana". A large number of beach bars and some restaurants keep this place alive through the night. Kava Beach (Slatina) - located at the eastern end of the island Ciovo, only 12 km from the town of Trogir, one of the unspoiled natural beauty. To reach it, you must pass the village of Slatina and the drive for more than 4 km to the east, with mostly gravel, and sometimes very rough road. Honey Beach (Seget) - 3km long gravel beach surrounded by pine woods and various sport facilities located 4 km from the city center.